What Are Progressive Lenses and No Line Bifocals? Progressive lenses are the most exciting and technologically advanced spectacle lenses available. If you're a 40-something who has trouble reading fine print, you have more lens options than the old lined bifocals your parents wore. Progressive lenses, sometimes called "no-line bifocals," are multifocal lenses that eliminate the lines of a bifocal or trifocal lens. They look exactly like single vision lenses so nobody will know your arms have gotten too short to see small print! They continue to increase in popularity and are now the most widely purchased lenses to correct presbyopia (the loss of near vision with age). Some people experience problems with progressive lenses when they try to adapt the first time or even to a new pair in a different frame and/or a different optical prescription. See below for causes and solutions to progressive lens problems. Progressives provide a more natural correction of presbyopia than bifocals or trifocals. They are considered "multifocals" because there is a seamless progression from distance to near with an intermediate section in between. This provides many focal points in order to satisfy almost any visual need. With progressives you can look up to see clearly across the room or down the street while driving. You can also look ahead to see your computer or someone sitting across the dinner table through the intermediate section. If you drop your gaze downward, you can read fine print comfortably through the bottom of the lens. There is a corridor that runs vertically down the middle of the lens and measurements will be taken to fit the corridor in the right place so all powers can be accessed comfortably. Progressives also eliminate a problem called "image jump" which is experienced with bifocal and trifocal lenses. The lines on the lenses create a drastic change in power which causes images to appear to jump as you move from distance to near. Progressives create a smooth, more comfortable transition from distance to near and back. Progressive lenses are far more sophisticated and technologically advanced than their common name (often called “no-line bifocals”). The newest, best version of these lenses provides the closest thing to natural youthful vision that a presbyopic person can achieve. Progressive lenses provide an uninterrupted view of the world with a gradual focus change from far to near and everything in between without the traditional bifocal line that so many perceive as ugly and a sure sign of aging. The best brand of progressive lenses is far superior to conventional bifocals or trifocals in virtually every comparison except price. Yes, progressive lenses are technologically superior to bifocals and do cost more. Many optometrists and opticians also recommend that when you purchase progressive lenses you should buy the best the optical store has to offer. We recommend MyFocal HD Progressive lenses (sold exclusively at Visionworks) or one of the best Varilux brands. Vision distortions, narrow viewing areas and the inability to adjust to your progressive lenses are much more common with inferior quality brands of progressive lenses. Patients must learn about progressive lenses so they can understand how to use them and what to expect. Remember to point your nose directly at what you want to see. Then raise or lower your chin until the object comes into the best focus. You may feel an initial difference in peripheral vision that will require some slight changes in horizontal head and eye movement. This will diminish with wearing time. Most people will adapt in a few hours although some can require as long as two weeks. If you are not adapted within two weeks you should return for a consultation with the optician that fitted your eyeglass frames to your face. the wrong type of progressive lens design (soft design vs. hard/short corridor) for the patient's needs. See below for more explanation. the specific brand of progressive lenses-in general, higher quality progressive brands such as EV4.0 (sold exclusively at Visionworks) and Varilux tend to offer better quality of vision and ease of adaptation. patient not understanding how to use the progressive lens and/or not allowing enough time for adaptation. frame adjustments are not correct for the individual or are different from previous glasses: (vertex distance, i.e. distance from eye to lens; face form wrap; pantoscopic tilt - tilt/angle of frame in relation to the face; frames too high or too low on nose). Problems with progressive lenses are NOT caused by the doctor's prescription in most cases. If the initial frame measurements are slightly displaced you will not be looking through the proper part of the progressive lens. Therefore, you will experience blurred vision or an inability to feel right visually when wearing the lenses. A new measurement for the position of the lens and remaking the lens or adjusting the frame should solve the problem. Assessing the specific needs and vision requirements for each person must be analyzed and the proper choice of a soft design or hard/short corridor design chosen. See "Types of Progressive Lenses" below for more information. The design of progressive lenses will allow you to see clearly at all distances, but it also creates aberrations in the lower periphery of the lens. These aberrations will cause slight blur and distortion and are more obvious when looking far right or left especially through the bottom of the lens. You can see these peripheral zones as the light colored areas in the diagram above. 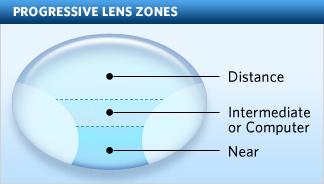 As a progressive lens wearer looks through the distance, intermediate and near zones of the lens everything is clear and in focus. The transition between different distances is smooth and natural. This peripheral distortion may also cause a "swimming" feeling at first which should go away with adaptation. Progressive designs have improved greatly in the past few years and most first-time wearers have no problems at all. If you do have blur or a swimming feeling, it will help to point your nose at whatever you are looking at in order to avoid looking through the periphery of the lens. As you adjust, you will not have to worry about your head position anymore. Certain people will take longer to adjust than others, but with new technology and designs nearly everyone can wear progressive lenses successfully if the eyeglass measurements are accurate. To look at an object, turn your head and look directly toward it (do not just turn your eyes). Then simply raise or lower your chin until the object comes into focus. In order to fit multiple powers into one lens, the lenses must be a certain size vertically. Due to new design innovations they can now fit into much smaller lenses than they could before. See "Types of Progressive Lenses" below for detailed information. Always choose frames with adjustable nose pads for a greater chance of success with your progressive lenses. The ability to make slight frame adjustments enables your optician to correct minor problems associated with the position of the lenses in relation to your eyes. There are many choices among the various styles of progressive lenses. The styles differ mainly in the corridor and how much of it is devoted to intermediate or near vision. "Short corridor" or "hard" progressive lenses are able to fit into very small, fashionable frames with a good sized area for reading but little or no room for intermediate vision. "Soft" progressives have a larger intermediate zone for computer work. You can also get progressive lenses in a wide variety of lens materials or with Transitions which automatically get dark in the sun. There are essentially two different progressive lens designs - Soft Design and Hard/Short Corridor Design. There are numerous different brands within each of those categories. Here we will only explain the two different generic designs. The Soft Design Progressive Lenses are typically used when the lens size of the chosen eyeglass frame is at least 27 mm from top to bottom. A Soft Design provides a wider and longer field of view for viewing intermediate range distances, i.e. 18-30 inches than the Hard/Short Corridor Design. The Soft Design also provide a more natural vision due to the subtle, less noticeable "areas of soft focus" (non-useable peripheral areas of the lens). A soft design progressive lens provides full use of all viewing zones-distance, intermediate and near compared to a Hard/Short Corridor Design. The Hard/Short Corridor Design enhances the clartity of the distance vision slightly compared to the Soft Design because there are virtually no areas of aberration (distorted, blurred vision areas) in the distance zone of the lens. The Hard Design also enables people to wear smaller frames with shorter vertical height measurements of the lens. It is effective for younger presbyopes (ages 40-48) who have little need for the intermediate range lens powers. It has a slightly wider field of view for near range (14-18 inches). Longer and wider intermediate area for better vision at 18-30 inches. Therefore, better for those over 50 years of age. More natural vision due to less noticeable areas of distortion on lens periphery. Better for those that have difficulty adapting to the edges of the corridor in the hard/short corridor design. Better for those who have previously worn a soft design with no complaints. Possibly better for those that only require a clear and wide field of view at distance and near (estimated ages between 40-48). Possibly better for those desiring better distance vision because there are virtually no areas of aberration/distortion in the distance vision zone of the lens. The only progressive lens option available for those that choose to wear a smaller frame.